Business organisations are aware of the importance of knowledge to keep and acquire competitiveness, so willing to find and keep knowledge holders in their organisations. However, employees in many developed countries have freedom to choose what to do for their living; it is possible a suddenly leave regarding their current jobs and get a new job elsewhere. This is a great loss for the former employer, because it means that not only the knowledge holders themselves but also their knowledge leaves the former business. Moreover, this knowledge would be beneficial for the new employers which are often competitors of the former employers. In order to avoid this kind of brain drain, employers often require that employees sign non-disclosure and non-compete agreements. Nevertheless, this request can cause some trouble in the long run. This chapter shows the structures causing this trouble and how to deal with it using the systems thinking approach. Knowledge and knowledge holders are crucial resources for competitive business organisations. Baskerville & Dulipovici (2006) indicate two classifications for knowledge: organizational knowledge and personal knowledge. If knowledge is dealt with as organizational knowledge, the rights concerning knowledge of the organization, knowledge acquirer, should be protected as the organization’s property. On the other hand, the rights of a person, the knowledge holder, would be protected when the knowledge is classified into personal knowledge. 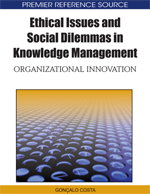 Teece (2000) defines organizational knowledge as information being incorporated in organizations’ activities. Naturally, such knowledge can be either articulated or tacit (Hedlund, 1994). Griffith, Sawyer & Neale (2003) give more detailed classification; organizational knowledge should be articulated and captured by some systems like information technology, and on the other hand, tacit knowledge in an organization would be called social knowledge. Myers (1996) illustrates that personal knowledge should be recognized as an attribute of its knowledge holder. Fahey & Prusak (1998) define knowledge as something known by someone. They stress the points that knowledge is produced only by knowledge holders and that knowledge acquired by organizations and embedded to task routines is always incomplete. Davenport & Prusak (1998) define knowledge as a mixture of experience, values based on contextual information, and insights. This thought is clearly based on the idea that knowledge is produced, matured, and used in knowledge holders’ heads (Gottschalk, 2005). The current ubiquitous computing society provides free or low cost access to various kinds of information; information is stored in computer devices, and these are mutually connected as a network. Such online information can be accessed by anyone with a computer. Besides, information can be accessed by ones who are not authentic creators, nor-owners of the information, and such access can also stimulate someone to create new value. This means that just storing or collecting much information no longer improves competitiveness of business players. This is completely different from tangible properties. Knowledge, which is the form of “a fluid mix of framed experience, values, contextual information, and expert insight that provides a framework for evaluating and incorporating new experiences and information” (Davenport & Prusak, 1998, p. 5), needs “a constant renewal through the accumulation process” (Costa & Silva, 2007, p. 125). Recently, knowledge is still more important in order for business people and organizations to be competitive than ever. The highly uncertain current situation requires us to solve new problems one after another using knowledge. Knowledge is not a product itself; using knowledge can produce something. Hiding or limiting use of knowledge does not earn anything. Rather, it would simply waste resources. Knowledge comprises information, and information reveals itself when being used (Arrow, 1962). Dealing with knowledge like a tangible or scarce resource may lead organisations to inefficient knowledge use and result in lowering organisations’ competitiveness for obtaining consumers’ advocacy.